Also spheric or cylindric objects are well suitable for beeing marked with microglyph®. A crucial advantage! For a successful decode, an arbitrary visible clipping of the code is sufficient. The decoder doesn’t necessarily have to “see” the whole code. 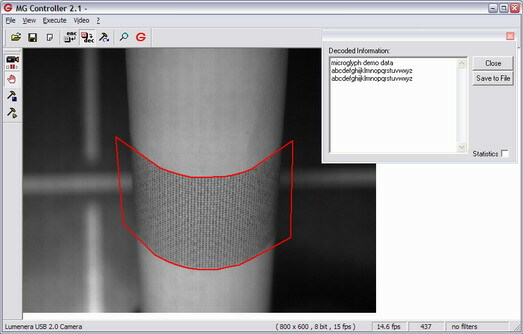 microglyph decoded on a cylindric object. Parts of the code remain unvisible behind the horizon of the surface.